A prolonged bout of man-flu meant that I had little energy for much apart from lying in bed reading and watching films over the last week or so. (Fully recovered now, thanks.) So that takes me to The Best Years Of Our Lives, winner of the 1947 Oscar for Best Motion Picture, with another seven (eight by some counts) Oscars on the night - Best Director, Best Actor, Best Supporting Actor, Best Writing, Best Supporting Actor, Best Editing, Best Music, an honorary award to Harold Russell for the role which also won him Best Supporting Actor and arguably also earning Sam Goldwyn his Irving Thalberg Memorial Award. It was the highest-grossing film in both the USA and the UK since Gone With the Wind. I had not heard of it. Russell, the only actor ever to receive two Oscars for the same role, is not depicted on the promotional poster (probably because it was his first ever film role - in fact I think his first professional acting job). Both IMDB rankings have The Best Years Of Our Lives ranked fourth of all films of 1946 (here and here), with It’s A Wonderful Life and The Big Sleep ranked ahead of it in both cases. Poorly educated as I am in cinema, I have not seen either of them, nor as far as I can tell have I seen any other film released in 1946. Here’s a contemporary trailer, which, in a bold approach to spoilers, leads off with the wedding scene at the very end of the film. Following on from last year’s The Lost Weekend, it’s another harsh dose of contemporary reality, as three servicemen, demobbed after the war, return to their home city and face agonies of readjustment, as do the women they love. 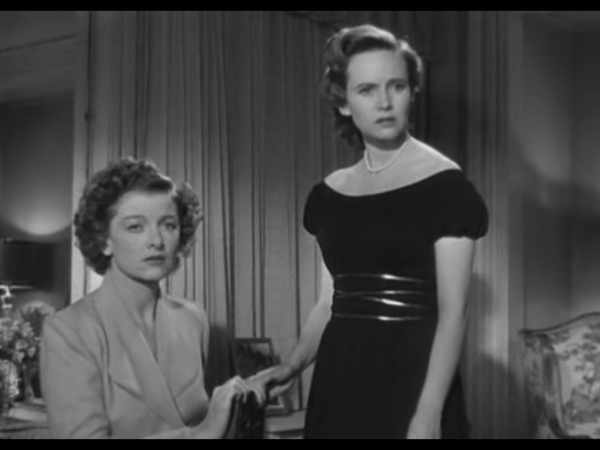 We’ve seen two of those women before - ten years ago, Myrna Loy was the second wife of The Great Ziegfeld, and four years ago, Teresa Wright was the daughter-in-law of Mrs Miniver. Although only thirteen years apart in age, this year they are playing mother and daughter. As usual I’m going to run through the film starting with areas of weakness. The biggest: it’s 172 minutes long, which possibly explains why it didn’t get shown much on holiday TV schedules when I was a child. 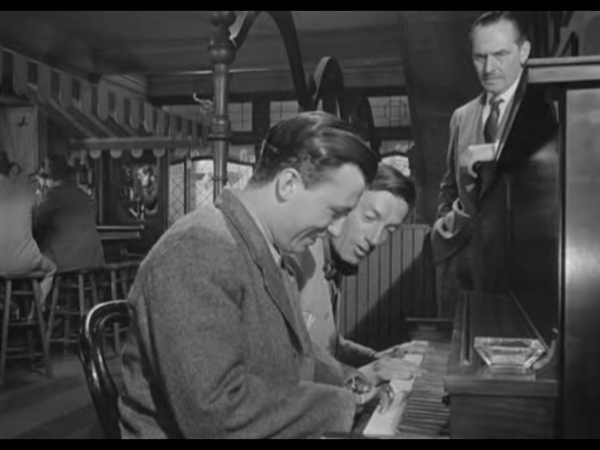 It was obviously a labour of love from the director, William Wyler; I don’t really think it needed three hours to tell the three male leads’ stories. 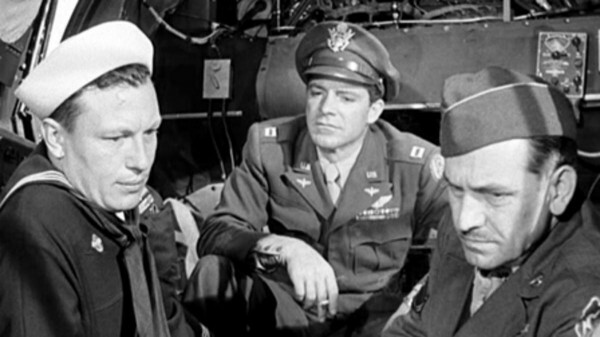 Of the three leads, Dana Andrews as Air Force vet Fred Derry is meant to be the central character, and doesn’t quite pull it off to the extent that the other two do. 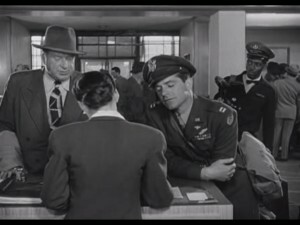 One obvious issue is that Fred Derry is written to be in his early 20s (explicitly 21 in the original story) and Dana Andrews was 36 in 1945. 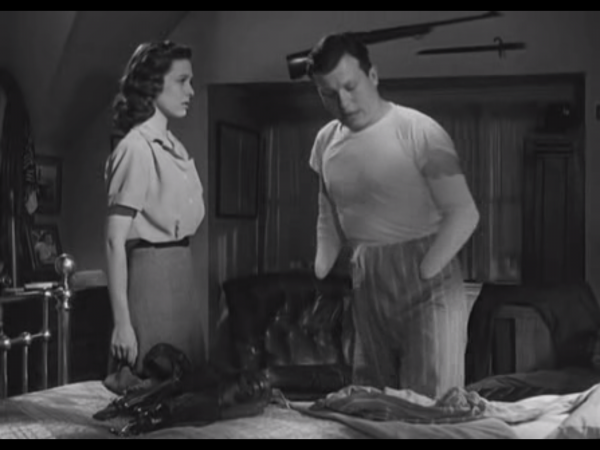 It weakens the impact of the storyline of his impulsive marriage, now regretted by both him and his wife Marie (played by Virginia Mayo). 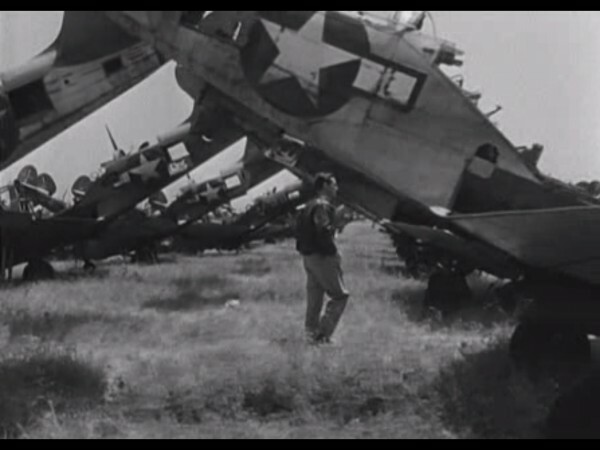 He does get a brilliant moment at the end with the mothballed warplanes, already relics from the war that he can’t escape. 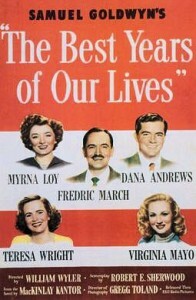 Poor Myrna Loy as Milly, who was the biggest star in the film when it came out, doesn’t get to do much more than smouldering concern about her husband Al, an Oscar-winning performance by Fredric March, and their daughter Peggy, as played by Teresa Wright, who falls in love with Dana Andrews’ Fred. 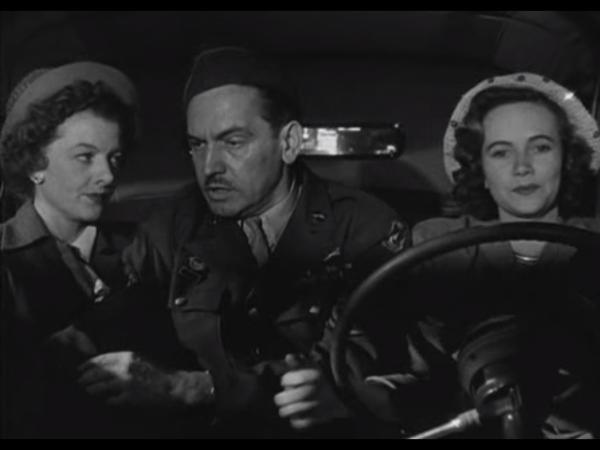 March however is very good as Al, a respectable banker who only made it to sergeant in the war, and is deeply disoriented by the return to civilian life. The first hour of the film covers the first day home of the three men, and Al in particular self-medicates horrifically with alcohol, not for the last time; a call-back to last year’s The Lost Weekend. 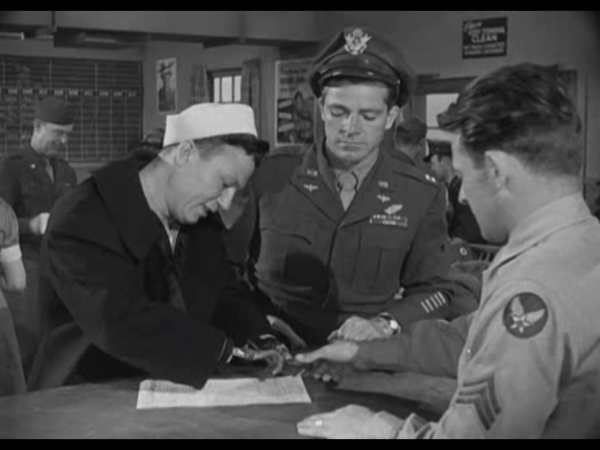 The show is stolen by Harold Russell as Navy Petty Officer Homer Parrish, who had himself lost both his hands in the war and had become incredibly nimble with his prosthetic steel hooks, to the point of signing his name on a form and playing Chopsticks with Hoagy Carmichael's Uncle Butch Engle. In general the cinematography and music are good too - impressive use of depth (as you can see from several of the above screenshots), and a warm Oscar-winning score by Hugo Freiedhofer. You can find most of the good tracks on YouTube (here, here, here, here, here, here and here); this is the incidental music for the scene with Homer and Wilma. I was really impressed by this film, and I am ranking it ahead of last year's The Lost Weekend and just behind that other great war film, All Quiet on the Western Front. You can get it here. Next is Gentleman's Agreement, of which I know nothing. (It’s hard to think that you are young when you are seventeen. The biggest change made for the screen is that the original Homer had PTSD and brain damage affecting the motor system on one side of his body; when Russell appeared on the scene, the character's disability was changed to the physical loss of his hands. Having said that, the character arc is pretty similar, though more dramatic, with Homer attempting suicide with Fred's gun and Wilma then talking him round to continued life, with her support. Squeezed precious in her hands. “About a man ... he used to be like you. He wrote this book himself—a man named Carlson. He couldn’t walk, and he was born that way. You have to re-establish it—the pattern. You have to will them—think them out. In general the poem has more drama (perhaps even more plot), though one early and significant divergence is that Fred and Marie decide their marriage is over the night he gets back, rather than trying to make a go of it as they do for most of the film. He is far from blameless - he has had several love affairs during the war, including one with an aristocratic Englishwoman, and he hits Marie when he discovers that she has been doing the same. “You file for the divorce,” he said. That’s enough. But don’t you spend too much. And counted off five Twenties. It’s all you’ll get from me. No alimony, babe. And Fred and Peggy get somewhat better closure than on screen (in that they definitely bonk, but in a poetic way). You lug your War along with you. Look up one day, and vaguely see it gone. You do not see yourself in malformation. Of War upon their backs—You count them well deformed. You do not hate, you do not love them for it. And think of folks who aren’t. Until you tire of it. And one day it is gone if you are wise. I thought you'd seen the Olivier Henry V.
"It's A Wonderful Life" is one of those films I am sure are good, I just don't like it. "The Big Sleep" oddly is also in that group. I've seen remarkably few of the other films. 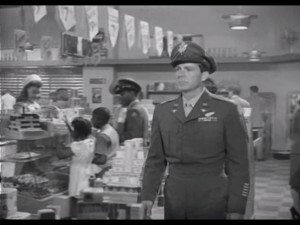 There's a Hitchcock, which is one of the few I haven't seen, but the bits I have seen are good. Nope, haven’t seen any of the Olivier Shakespeares, though I screencapped Patrick Troughton and Peter Cushing in Hamlet (which I will get to soon). Ooh, in that case, I like it a lot more than modern critics (although I understand where a lot of the criticisms come from) and I love the way the opening and the transition back to the Globe are done at the end.